The Cape Wind Project proposes a 420 MW wind turbine energy farm to be located in Nantucket Sound about five miles south of Hyannis, Massachusetts. This wind farm would be one of the first of its kind in the United States, and would provide almost 75% of the average electricity demand of Cape Cod, Nantucket and Martha's Vineyard. Additionally, it promises to directly offset petroleum use from the Canal Power Plant in Sandwich. 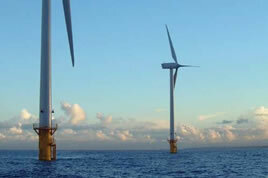 Tech Environmental performed comprehensive sound and vibration impact assessment for the operation of the wind turbine farm, addressing both airborne effects on nearby coastal communities and underwater effects on marine mammals. Tech Environmental provided baseline sound level monitoring underwater in Nantucket Sound and along the south coast of Cape Cod on Martha's Vineyard. Since underwater sound level limits have been set by NMFS to protect marine mammals during pile driving of wind turbine towers, Tech Environmental monitored these levels during construction of a first tower, to be used for environmental data collection. The hearing thresholds and bandwidth for marine species were quantified, and species-specific hearing threshold sound levels (dBht) were predicted for project construction and operation. No injury to marine mammals, sea turtles or fish would occur as a result of the project. These studies were included in the federal EIS for the wind power facility. An offshore wind farm required sound and vibration analysis to ensure that coastal communities and marine mammals would be protected from adverse impacts. Tech's analysis ensured that communities would not be adversely impacted by noise and that marine life would not be harmed as a result of the project.